Congratulations to Freddie Mitchell on enjoying the first win of his career this afternoon at Lingfield on BRABAZON in his debut ride under Rules. Freddie, a successful pony race rider, put his experience to good effect winning by 10 lengths and looks to be following in his elder brother Jack’s successful footsteps. Amateurs make the front page! Congratulations to 16 year old Robbie Williams on the second win of his career at Wolverhampton this afternoon for trainer John Llewellyn. The field completed the first circuit at a very slow canter before quickening with Robbie snatching success in the closing strides. 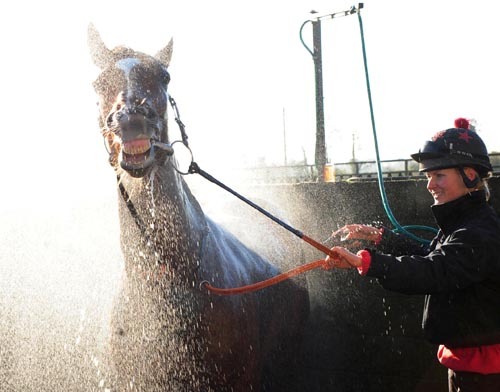 Robbie has been nominated as Ride of the Week by Bob Cooper on At The Races for his win after surviving his saddle slipping as they jumped off out of the stalls. A seasoned and successful pony race rider, Robbie managed to pass the post with saddle and weight cloth intact. Its a long journey home for our French friends today after arriving in Folkestone ready to take on the British jump jockeys team in this afternoon’s challenge. 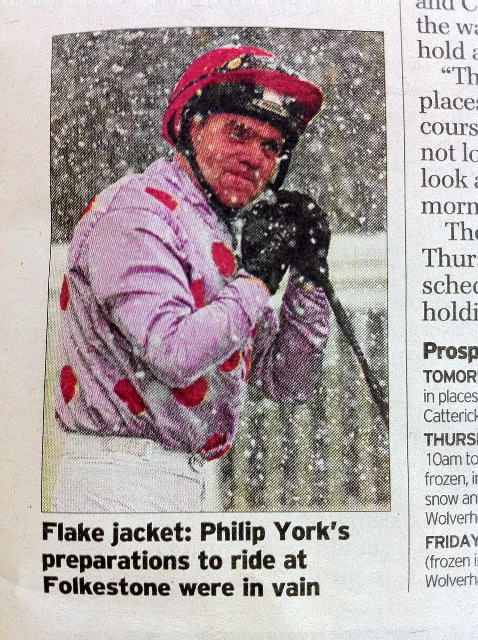 The ground having survived inspections yesterday, at 7:30 this morning and again at 11:45 am, the runners and riders braved the elements and were down at the start when the snow started to fall fast and thick. The horses’ feet were inspected and snow was found to be balling underfoot, creating serious safety concerns. 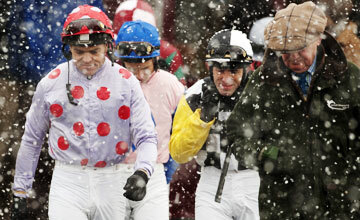 The horses cantered back to the paddock, where further deliberations took place in the snowstorm before the meeting was finally abandoned. 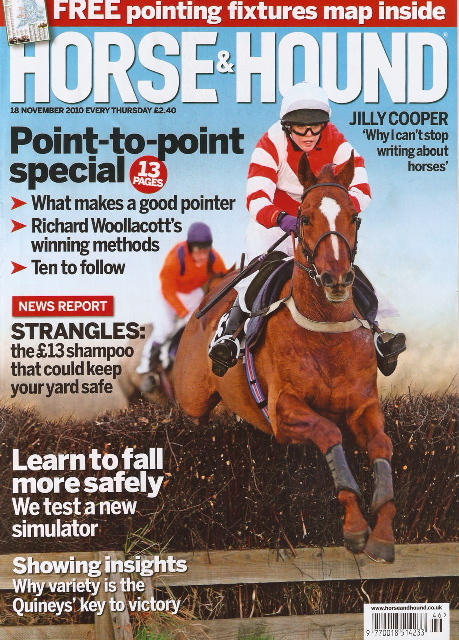 Fresh from his run in the Greatwood Charity Race at Cheltenham last Sunday under Jo Ewell, Candarli appears on the front cover of this week’s Horse & Hound partnered by Chloe Boxall winning the Members at the Black Forest last season. 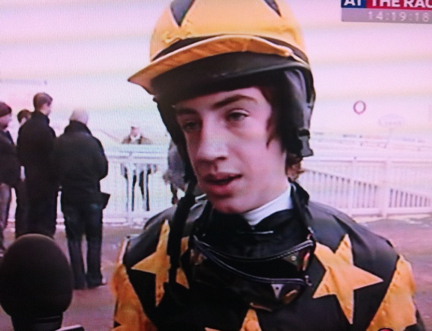 Congratulations to Jack Quinlan on riding JOAN D’ARC to her third success over hurdles at Fakenham today and making good use of his claim. 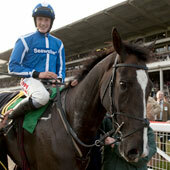 Annie gives Ireland solitary win at Cheltenham! 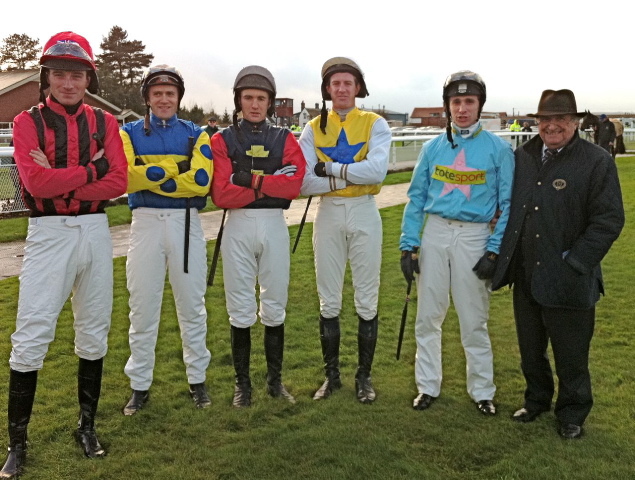 Many congratulations to 10 valiant charity race jockeys who enjoyed riding around Cheltenham’s old course this afternoon in aid of Greatwood, the charity that not only provides sanctuary for racehorses but also supports children with learning difficulties by their unique programme Horse Power, and raised over £23,000 in the process. Ireland was well represented with Barry Connell’s colours worn by PAUL O’LEARY, this year’s Newmarket Town Plate victor DEREK JACKSON, Ireland’s Evening Herald scribe NIALL CRONIN and Irish Field’s diarist and fiancée of Grand National winning trainer Gordon Elliott, ANNIE BOWLES. 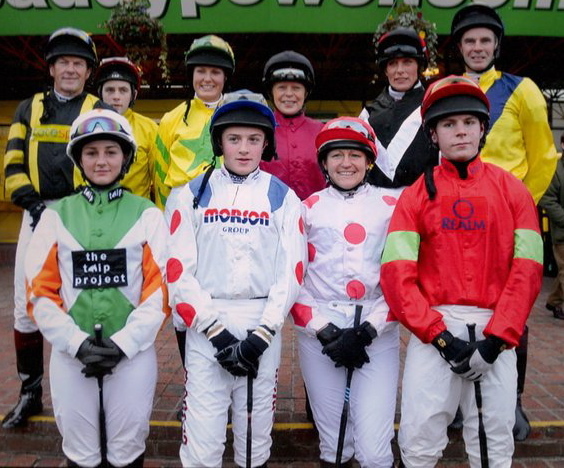 In addition, jockey’s nephew JAMIE INSOLE and Paul Nicholls’ nephew HARRY DERHAM lined up alongside SUZIE GARDNER from the TRIP project, JO EWELL winner of Larkhill’s 2007 charity race, local JULIE MILNER who rode in Cheltenham’s 1993 Red Nose charity race and ALISON POCKLINGTON, Yorkshire’s novice lady point-to-point champion 2007 who was celebrating her hen weekend! The pace was set from flag fall by Annie Bowles on Wikaala, her regular ride at home, and she led the field from start to finish winning by 9 lengths and giving Ireland its only winner of the 3 day meeting. 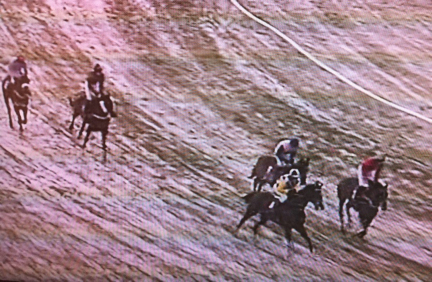 There was a race for second place which was won by Harry Derham on Font, 2 lengths ahead of Paul O’Leary on Ten Fires with Alison Pocklington ten lengths back in 4th on Winged Farasi. Many congratulations to all our riders on a great spectacular finale to the Open Meeting, and immense thanks to all at Cheltenham Racecourse for making this possible. 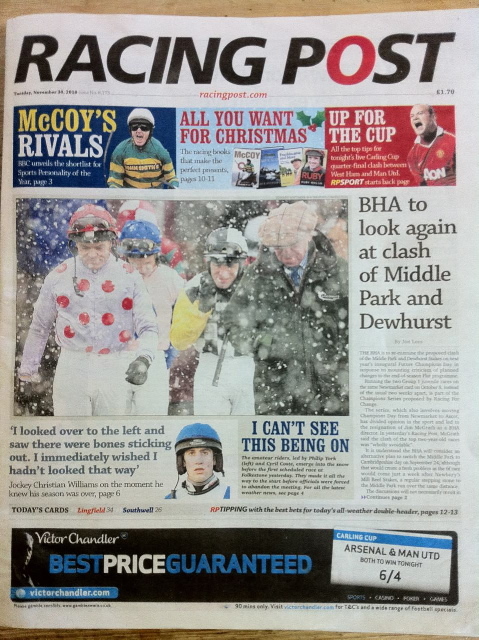 Congratulations to Sam Twiston-Davies on a fantastic win today in the Paddy Power at Cheltenham. Currently leading conditional jockey aged 18, Sam is reigning runner-up to Oliver Greenall in last season’s NH Amateur Champion Jockey Championship. Also congratulations to Harry Challoner, Charlie Huxley, Brian Toomey, Peter Toole and Jimmy Derham who also won today across the UK. What a great day for those who chose the amateur ranks to gain experience before turning professional. 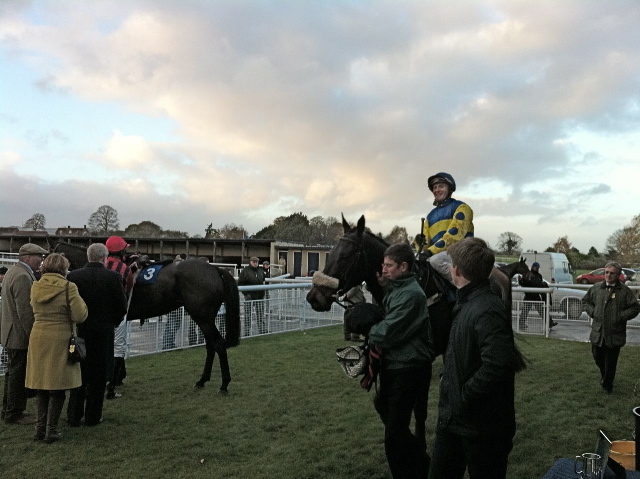 Well done to James Banks on a great win in the opening race of Cheltenham’s Open Meeting, the Irish Times Amateur Chase. His guv’nor Alan King was full of praise for his amateur jockey after he bided his time on RUSTARIX, taking a narrow lead two out and staying on well under pressure on the run-in to win by a length. Congratulations to winning connections! James has been based at Barbury Castle for three years and recently represented Great Britain for FEGENTRI in a race in Bremmen. The inaugural running in Great Britain of the Tri Nations Challenge was held today at Ludlow, following France’s hosting of the first race in the series back in July at Pompadour when Miles Seston was victorious for Great Britain. After a strong entry of 17 runners, disappointingly only 5 were declared. Many congratulations to France’s Jean-Philippe Boisgontier who rode his first winner in Great Britain when partnering Neil Mulholland’s game JUST THE JOB to produce his 3rd win from 4 runs this month.